Based on that fragment of a story, Chris Bouchard’s The Hunt for Gollum is a remarkable achievement of independent filmmaking. Shot in Wales for a paltry $5,000, Bouchard achieves something that even Peter Jackson had trouble sustaining: a taut forty minutes of cinematic suspense without letup. With just a snippet of Tolkien lore, Bouchard has created a dark, gorgeous film with impressive production values and terrific performances. Aragorn: The rangers have doubled their watch, is it still safe? Gandalf: Yes, the enemy doesn’t yet know that the ring has been found. But I’ve made a grave error…it concerns the former owner of the ring. Gandalf: He’s left his cave, and his mind is bent on recovering it. Aragorn: Gollum knows, doesn’t he, Gandalf…the location of the ring. Gandalf: Yes, the foolish hobbit revealed his name. Aragorn: I will find him. What follows is Aragorn’s solitary quest through the fields of Rhovanion to the vale of Anduin as he tracks Gollum. This sequence is gorgeously shot, at one point the camera lingering on a pool of water reflecting Aragorn’s passing. This is mythic filmmaking and Bouchard displays remarkable skill and cinematic vision. Soon after Aragorn captures Gollum, he encounters a roaming band of orcs, and the fight scene at twilight is gripping and choreographed with desperate urgency. Surrounded and outnumbered, Aragorn kills without quarter in an unrelenting bloody fight. Adrian Webster is on the screen for nearly the entire 40 minutes, and the film stands or falls on his performance as Aragorn. Although he lacks the star power of Viggo Mortensen, Webster captures the deep melancholy of the exiled Aragorn--a man blessed and cursed by a noble lineage, a burden that he carries with grace and humility. And Webster looks authentic; in fact a great strength of this film is the deliberate care that Bouchard has taken in outfitting his cast, from its hero down to its villains. The costumes and makeup is that of a big budget film. Patrick O’ Connor as Gandalf is equally convincing, and perhaps the only mistake Bouchard makes is in not using O’Connor more than he does. But the casting of The Hunt for Gollum is spot on, from the two leads down to the orc brigade. Yet the real wizard here is the director himself, for Bouchard’s mastery of this material rises to auteur level. The pristine cinematography coupled with the film’s haunting score provides frame-after-frame of stark beauty. And yet for such a strikingly pretty film, Bouchard creates a real sense of dread. 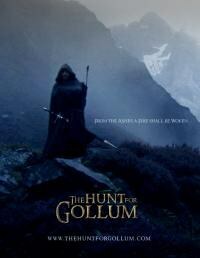 There are no pert hobbits in The Hunt for Gollum to lighten the mood, and the film takes a dark, fearful turn. When Gollum escapes during the fight with the orcs. Aragorn is forced to track him at night by torchlight. Eventually he finds Gollum cowering in a tree. A hooded black rider from Mordor bolts through the forest, and the duel between Aragorn and the screeching wraith in a midnight grove is the stuff of nightmares. Bouchard unfolds this story seamlessly, with perfect control, and one hates to see it end.